Scientists Zhuhua Li and Jin-Song von Storch, working in the group "Ocean Statistics" in the department "The Ocean in the Earth System" at Max Planck Institute for Meteorology (MPI-M), and Malte Müller from the Norwegian Meteorological Institute, succeeded for the first time in simulating long internal tides under realistic conditions with the high-resolution MPI-M ocean model. The scientists focused on the internal wave M2; with a wave period of almost 12.5 hours, it represents the energetically strongest component in the overall wave mix of tides. What are long internal tides and why are they interesting for oceanographers? Tides are periodic water movements across the entire depth of the ocean. They are created by tidal forces such as the gravitational force of Earth, Moon and Sun but are also influenced by the rotation of the Earth. The tides lead to waves on the sea surface and appear as ebb and flow on the coast. When tidal motion meets the uneven sea floor, waves are formed at the boundaries between water masses of different density in the interior of the stratified ocean. These waves are called internal tides. They have different wavelengths. Tidal waves with long wavelengths can propagate over long distances and dissipate along the way. Internal tides with shorter wavelengths usually dissipate immediately at their place of origin. Internal tides provide the energy necessary to maintain the global meridional overturning circulation (MOC). In the large-scale Atlantic current system (AMOC), for example, warm surface water, flowing north from the equator, cools down on its way toward the Arctic, and sinks to great depths, where it flows southwards as cold dense water into the South Atlantic. For the necessary mixing process of cold deep water with warmer water, mechanical energy has to be provided. Internal waves provide this kind of energy in the deep ocean. Long internal tides are, besides long inertial waves, the internal waves with the most energy. The importance of these long internal tides for the mixing and for the AMOC is still largely unknown with regard to their propagation and dissipation into shorter waves. It is not yet possible to directly obtain information about these processes from observations. As a consequence, mixing attributable to long internal tides has hitherto been represented by a spatially constant diffusion coefficient (parameterization) in most ocean circulation models. If anything, this represents the effect of only the short-wave internal tides. These short internal tides dissipate directly at their origin and are therefore easier to parameterize, but they only account for about 30% of all internal tides. It is, however, of great importance to simulate and investigate the long internal tides and their propagation using realistic global climate models because the AMOC reacts sensitively to the geographical distribution of mixing in climate models. Internal tides cannot be simulated with conventional ocean circulation models. On the one hand, tidal forces are usually not taken into account in ocean circulation models, since tides are traditionally investigated as movements of the entire water column using the shallow-water equations, and are thus separated from the three-dimensional ocean circulation. On the other hand, the grid of conventional ocean circulation models is too coarse to be able to resolve internal tides. The one-tenth of a degree-simulation, which was developed in collaboration with Malte Müller within the consortium project STORM and is known as STORMTIDE simulation, is one of the first to globally simulate tides, particularly internal tides, in a wave environment with a realistic stratification and circulation. It is an important first step towards a detailed understanding of long internal tides in a quasi-realistic ocean. Figure 1 shows the kinetic energy of the semi-diurnal internal tide M2. 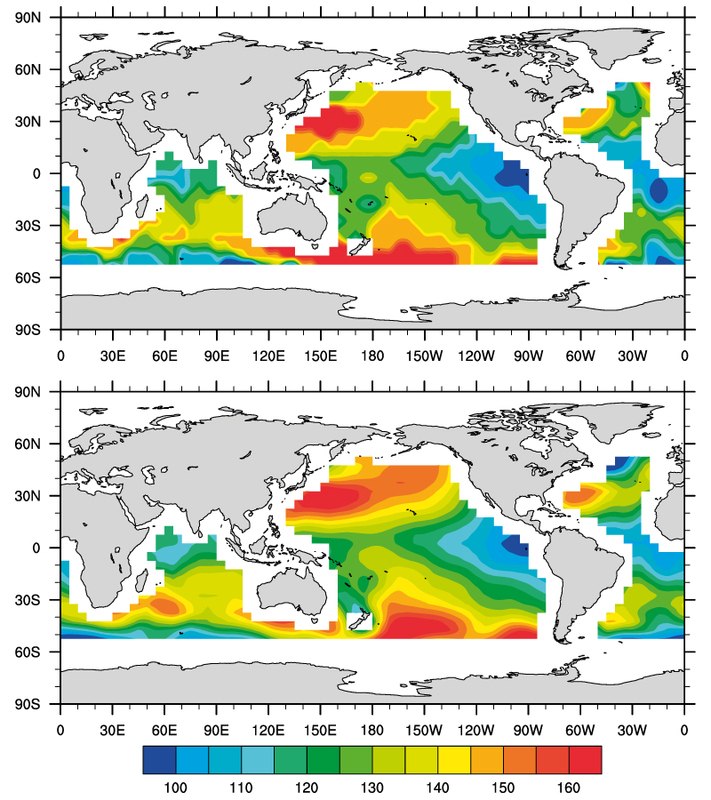 The authors focus on it because it has the highest energy content in the wave spectrum, and the activity of the internal M2 tides substantially varies with location. Fig. 1: The vertically integrated kinetic energy (J/m2) of the internal tidal wave M2 in logarithmic scale, simulated with the model STORMTIDE in a one-tenth of a degree-resolution. In the study, the authors primarily try to clarify whether the motion at tidal frequencies, simulated with STORMTIDE, are actually internal tides. The research methodology is developed within this study. The wavelengths are used as a diagnostic tool to quantify the waves and to answer the following questions: how consistent are the simulated wave motions with the dispersion relation of the linear internal waves, so that the simulated motions can be identified as internal tides? How many of the long internal M2 tides (or which modes) are resolved with the one-tenth of a degree STORMTIDE model? What characteristics do the simulated internal M2 tides have, for example, what are their wavelengths and geographical distribution? Last but not least: what are the roles of the ocean´s local stratification and the Coriolis force in identifying the geographical distribution? These questions are examined with the aid of wavenumber spectral analyses and the solution of eigenvalue problems. Fig. 2: Mode 1 wavelengths (km) for the internal tide M2, derived from the STORMTIDE simulation, applying a two-dimensional wavenumber spectral analysis (top) and numerical calculations according to the linear wave theory (bottom). In brief: STORMTIDE can simulate internal M2 tides. Results: The simulated wavelengths are in good agreement with the wavelengths predicted by the linear wave theory (applied to the simulated stratification, figure 2). The mode 1 wavelengths are in the range of 100-160 km. Extremely large and extremely small values are found in the Pacific. A zonal asymmetry and a general tendency towards increasing wavelength occur at increasing geographical latitudes. The STORMTIDE model does not only resolve the first but also the second mode. The mode 2 wavelengths are in the range of 45-80 km (not shown here). Values greater than 75 km are mainly found in equatorial regions in the Pacific Ocean and the northeast of the Indian Ocean. The zonal asymmetry is dominant for mode 2, whereas the latitude-dependent variation is not as pronounced as in mode 1. These characteristics can be explained by the dispersion relation. The asymmetry of wavelengths is caused by the local stratification of the ocean, while the meridional variations result from the combination of the effects of local stratification and Coriolis force. The authors found that the distribution of mode 1 is determined by stratification and the influence of the Coriolis force, the distribution of mode 2 mainly by variations in stratification. The movements simulated by STORMTIDE with a M2 tidal frequency can, to a first approximation, be considered as internal M2 tides. In general, the global model represents the long-wave internal tides well, especially where interaction with circulation is weak and linear waves predominate. Nonlinear parts, such as interactive processes between waves and currents, or between the waves, will be studied in more detail in the future, in order to find out how internal tidal waves propagate and transfer their energy to smaller scales.